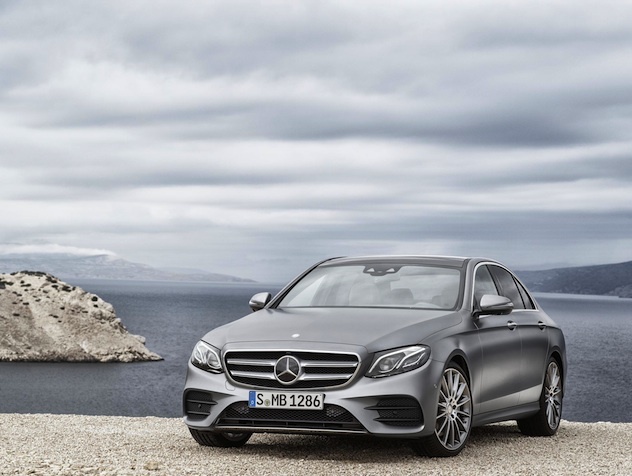 Mercedes has placed the 2016 E-Class Saloon on order for the UK, with deliveries for the new model beginning in summer. The range includes two lines, SE and AMG, along with two engines, a 220d four-cylinder diesel producing 195bhp and a 350d six-cylinder diesel with an output of 258bhp. All four versions of the E-Class have the new 9G-Tronic automatic gearbox fitted as standard, which has helped to improve the economy of both comparable engines to their predecessors. With more economic yet powerful engines, the E-Class models have an improved 0-60 time on the 2009 models whilst reducing the size of the engine. Also announced was the new petrol-electric hybrid 350e, with economy statistics of 134.5mpg and 49 g/km CO2 emissions, which will be made for sale later in the year. Standard features on the 220d SE include a Garmin satellite navigation system, parking assist and self-parking system, Collision prevention system and multi-functional steering wheel, with internal touch pads. The AMG package included on either the 220d or 350d models include extra body detailing, 19-inch alloy wheels - instead of the standard 17-inch - and the seat comfort package, with microfibre upholstery on the seats. The SE range starts from £35,935 for the 220d and the 350d is priced at £44,930. The AMG line begins at £38,430 for the 220d, with the 350d starting at £47,425.